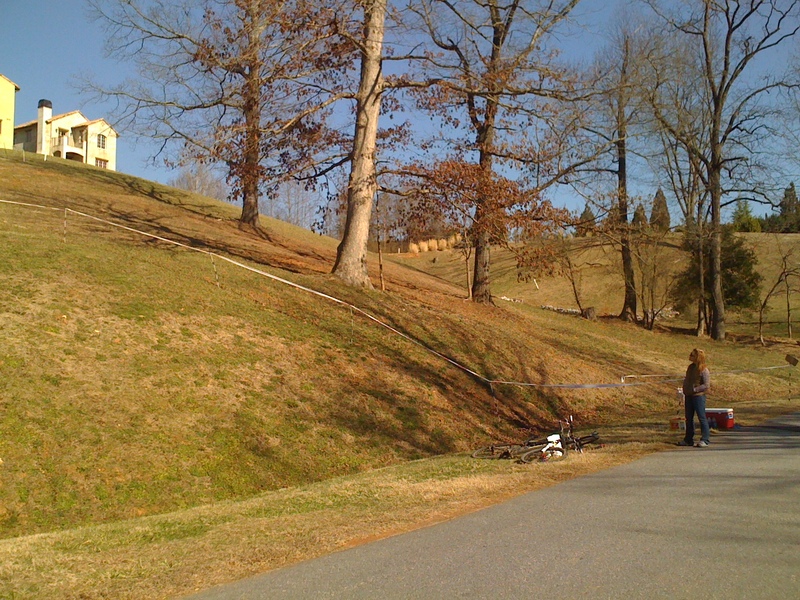 The race started out with a traditional cylocross course including some crazy run-ups through the steep hills of the Montaluce Winery just outside of Dahlonega (“Daw-lawn-eh-guh” in case you were wondering…). I knew that my skills would be lacking, but the course traversed some pretty deep grass which my mountain bike wheels floated over. This helped me to make it to the first run-up just behind the first few guys who were able to ride the 30+% pitch out of a ditch. I couldn’t ride it so I hopped off and ran up the slope. I knew that I could ride the next part which was only about 15% so I tried to remount rather than exercising my non-existent running skills. Unfortunately, starting on a 15% pitch in deep grass isn’t the same as starting on a 15% pitch with a road bike. I tried to clip in and pedal, but I couldn’t get enough momentum to balance and so I fell over – in front of everyone who was running up the climb. I felt bad as people had to veer around me, but I picked up my bike quickly and then proceeded to run the rest of the way up the climb (over 1/10th of a mile). The end of the run-up was a paved road so I remounted, flew down it to the main road which exited the winery on a climb, trying to catch the leaders. By this point I was maybe 20-25 riders back from the very front of the race. I passed about 10 people in the winery itself and then another few on the road outside the winery as it continued to climb. I made it to the very front of all the riders behind the lead group of about 3 or 4 riders who were almost out of sight by this point. Having spent the past five seasons racing pretty much exclusively on the road, I knew that my strong point would be hammering the road sections as hard as possible. I pulled for about 2 miles pedaling my largest gear as fast as possible. Then I realized I had a pretty strong group of riders with me and pulled off to let them help with the chase. We worked very well together rotating through the paved road section. I would guesstimate that there were maybe 8-10 of us? As soon as we hit the first gravel/dirt section, the pace didn’t really slacken at all. We just kept hammering and surprisingly continued to paceline albeit pulling over and letting somebody around was a bit tricker on the dirt roads. By the time we had hit the bottom of the first climb, we had lost 1 or 2 riders and I had slid to the back of the group. We were climbing fast, and I had a hard time trying to find the right gear to be in as I would alternate between too easy and too hard of a gear as the terrain and pitch changed. In the end, I got dropped about 1/3rd of the way up the climb with another guy who was riding a mountain bike (but with cyclocross wheels). We just couldn’t keep up with the lighter, stiffer cross bikes. Still, the two of us worked very well together, and I can tell you for sure that I would not have done as well as I ended up doing if I had gotten dropped by myself in this section. Instead, the two of us continued riding together literally inches behind each other going something like 5-7mph up this climb. I think we were both afraid to let any kind of gap open up because that would spell the end of being able to keep up with each other. When I would get tired, I would slow down just a tiny bit and move out of the way to let the other guy come to the front. Then I would hop right on his wheel, and when he got tired he would do the same. This was all happening over a sometimes loose/rocky dirt road at 5-7mph. What an amazing motivator that was though to have someone else there suffering with you and who wouldn’t let you slow down! I was able to keep my heartrate several beats above threshold for over 30 minutes of the climb! Finally, we made it to the first crest of the climb to get a breather for starting the final kick to the top. About halfway up this kick, some guy on a green bike rode up to us! It caught me completely by surprise because I had periodically been looking back and hadn’t seen anyone. Well, when he came up, he was going quite a bit faster than us and dropped us almost immediately. Fortunately, though the terrain was much more undulating across the true summit and before the long descent. This guy would drop us on each uphill, and we would nearly catch him on the downhill or the start of the next uphill. Once we made it to the long descent, our mountain bikes were able to handle the downhill better than his cross bike, and we flew down the mountain. Towards the bottom of the descent, the course came back out onto a paved road, and I drilled it for a few minutes with us sustaining close to 35mph. By the time the course made it back onto the dirt road to start the final climb, we had caught three more riders from the original group that we had been with. So for the very bottom of the climb, the group I was with had swelled to about 5 riders. I was feeling great and bothered a bit by our slow pace, but I kept anticipating that the climb would get steeper and I didn’t want to blow up. But the climb wasn’t getting much steeper, and I just felt like we weren’t going hard enough so I turned on the gas again. Only one rider was able to keep up. He and I traded pace together as we started to catch two more riders we would periodically see in the distance in front of us. As we got closer, the guy I was with fell off the pace and so I finished the bridge to the two riders in front of me by myself. I believe this picture below was taken during that part of the race, but I don’t know for sure. My second water bottle looks like it might be empty so I think that would put it about that time as I ran out of water shortly before the top. I would guess that this was about a mile or so from the top. The two riders I caught were Jayfer Beizer (Locos) and Gerry Pflug. I knew Jayfer a bit from road racing, but I didn’t know Gerry at all. All I remember is that he was one of the guys who looked really strong in the original group before I got dropped on the first climb. The three of us worked well together over the top of the second climb and then into the next steep uphill sections before the long descent. Jayfer was struggling a bit on the first uphill section, but made it up that one and was still with us until about halfway up the final steep uphill before the long descent. Gerry led the way down the descent at breakneck speed on his cross bike. I was having a bit of trouble keeping up on my mountain bike, but we were together when the descent went back out onto the road. I went to the front and drilled it again hoping to stay ahead of Jayfer since there were only three guys in front of us meaning a top 5 finish. Little did I know that we were actually gaining on 2nd and 3rd place! 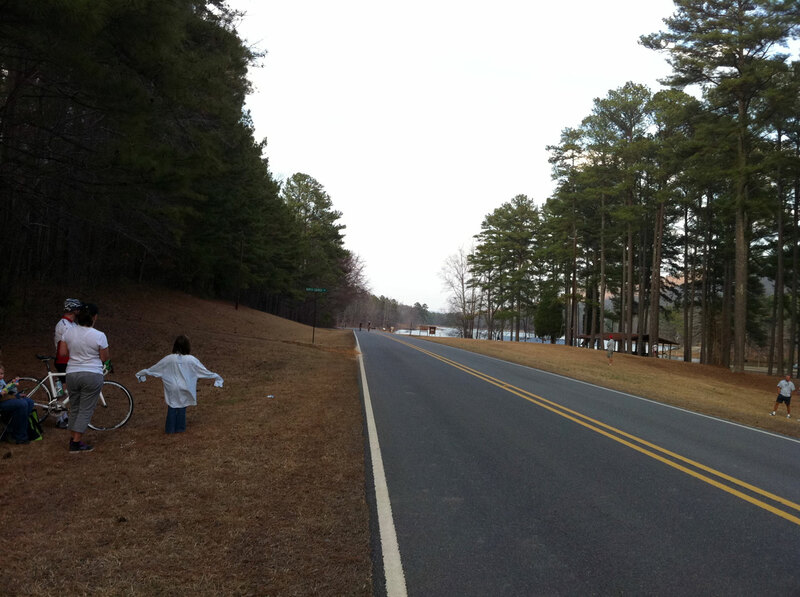 We were passing all the 30 milers on the road and saw up ahead somebody else passing riders. We knew he must be a 50 miler and redoubled our efforts right about the time we made it back to the winery. The final run-up was awesome – easily 40+% gradient to start out with then a nice 20% section. I was tired by this point and had run out of water before the long descent (almost 15 miles before the winery). I couldn’t do the run up by running straight up it. Instead, I had to “crawl” it at an angle before straightening out. Fearing a cramp, I pretty much walked the rest of the run-up, resigned myself to 5th place and cruised through the rest of the course as fast as I could, but still at a more leisurely pace than on the way out of the winery at the start of the race. The long grassy sections including the steep hill were rideable in my granny gear, and I didn’t see anyone behind me so I enjoyed the last few hundred meters rather than trying to crush it. The final run-up with free beer ice chest. When I finished, the 2nd (Brendan), 3rd (Stephen), and 4th (Gerry) place riders had also just crossed the line – but the winner, Thomas Turner (Jamis), had finished over 10 minutes earlier. Wow! It was fun rehashing the last bit of the race and how for such a long race, the finish times for 2nd – 5th place were really close together with us all on some part of the finishing cylocross course at the same time. I took my road bike with me for the weekend and got some really epic climbs in on Friday and Sunday. I’m going to save that for another day though and close this blog with my heartrate data and more pictures from Southern Cross. What a great way to start the season, and awesome training for Rouge Roubaix – first big road race of the season! Annotated heartrate and elevation data. Strava categorized climbs and descents. 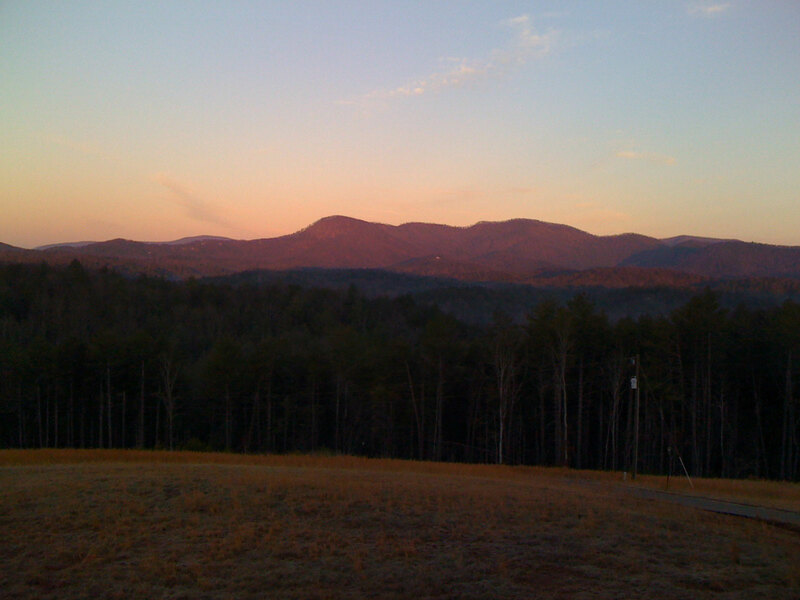 Sunrise on Columbia Mountain (Woody Gap climbs this on the opposite side). 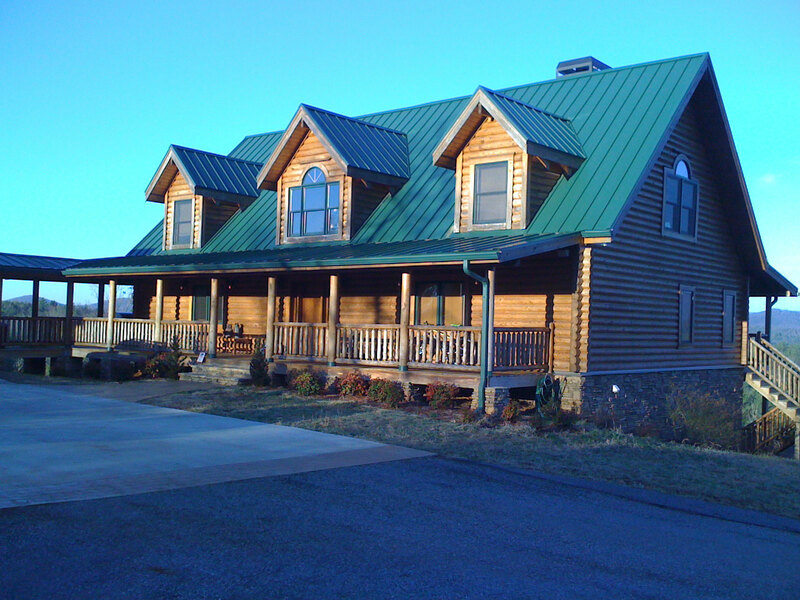 19 of us from Birmingham shared the cabin. It was awesome hanging out with everyone! 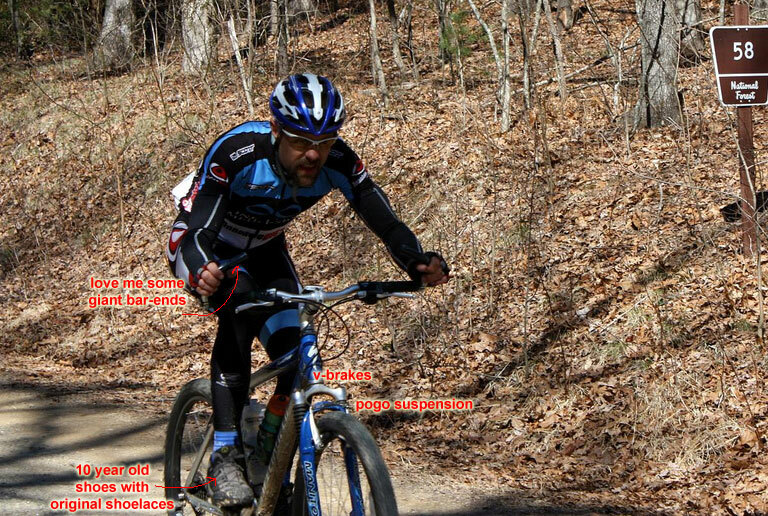 This entry was posted in Racing, Training and tagged heartrate, mtb on February 28, 2011 by kartoone. 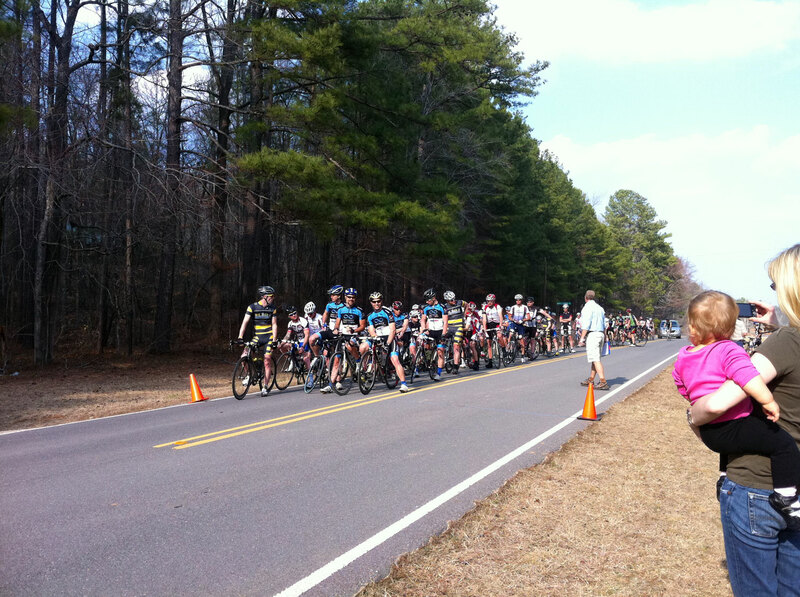 Excellent weather yesterday for our first team race of the year. About 20-25 guys lined up for the Category A race with our squad represented by me, Pat Allison, Chris Allison, Stuart Lamp, Mike Lackey, and Timo Stark. 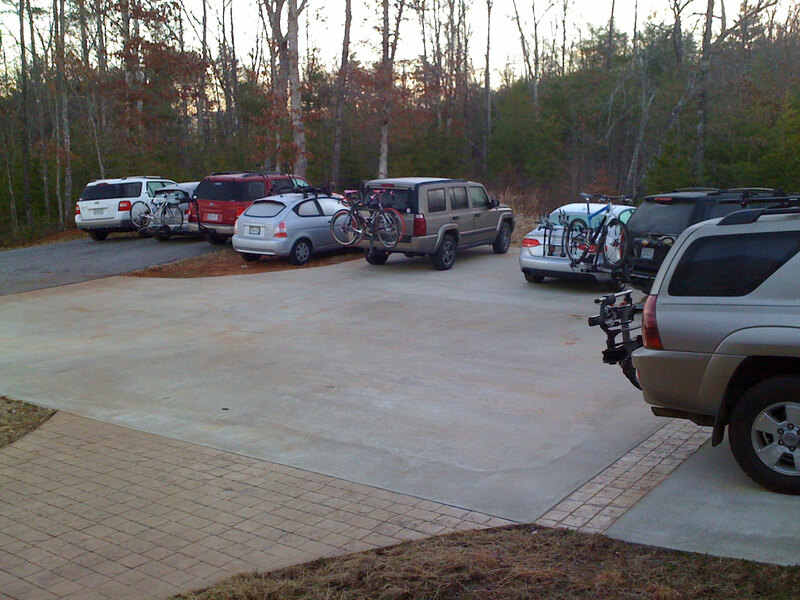 Other strong teams included Velocity Pro Cycles led by Ed Whitehorn and Preston Beasley; Bob’s Bikes/Alabama Masters with Will Hibberts, Jim Brock, and Miro Novak; Alabama Cycling with a few riders; and one more team with a kit I didn’t recognize, and then a few strong independents. Ed Whitehorn and I led out the group and rode at an easy pace up and over the first hill. As soon as you crested the hill, you were hit with a pretty strong crosswind, and several riders started to creep up on our somewhat leisurely pace. I could sense an attack coming, and sure enough on the flat section leading into the hill after the first turn, there was an attack which either Mike or Stuart covered. 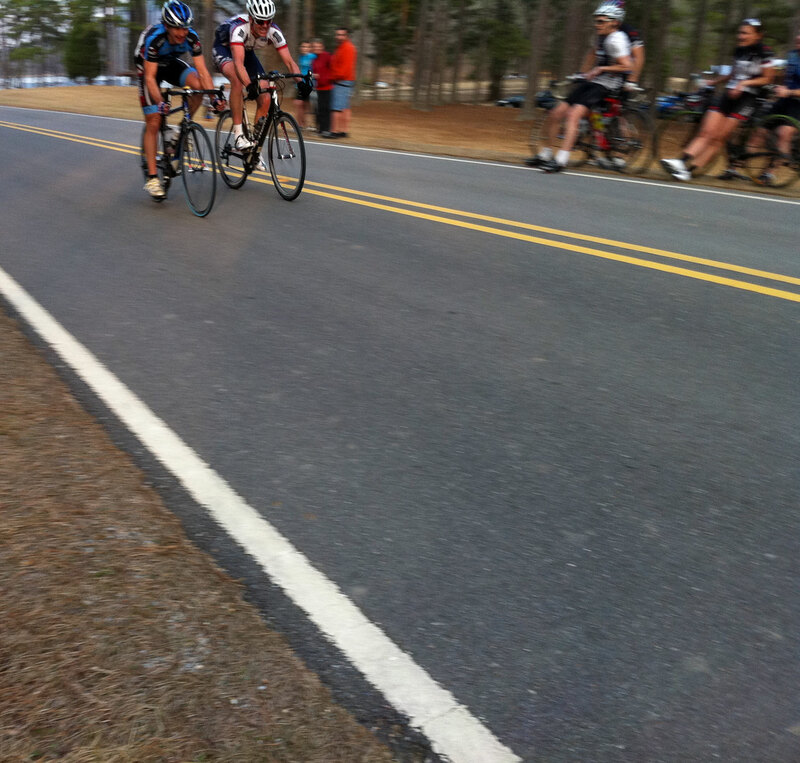 We were wanting to get a couple riders in the break, so when I saw someone else start to jump across I went with them. But it was too early in the race for the group to let us get away and so we were caught. For the next lap and a half you can cut and paste the previous paragraph as the same scenario played out multiple times with Mike and Stuart covering every move and then me trying to tag along with someone attempting to bridge. Every move got brought back, though. Then on the start of the third lap, our pace slowed again, and I believe it was Jim Brock who launched out on his own. A little while later Stuart attacked with somebody else. Pretty soon it was Stuart alone with three other guys. We wanted to have somebody else from our team in the break, so my teammate Pat Allison attacked and made it across a quickly widening gap with about 10 pedal strokes and tucking on the downhill. It was impressive to watch! Then another rider started to bridge, and I believe it was Timo who saw it and went with it. The two of them made it across and by this point, the “break” had about 10 riders in it, which meant there was only about 10 riders left in the field as we had dropped about 5 or 6 guys towards the end of lap 1 with all the attacking that had been going on. I liked that we had 3 guys in the break, but I didn’t like that the break was essentially half the field. So I waited until somebody came off of a strong pull on the long gradual downhill after the hill after Turn 1 and drilled it super hard. Somebody who was on my wheel saw it and jumped with me, but that was it. The field started to chase, but our gap was good enough right from the start that we were able to make it across to the break bringing our total to maybe 12 riders? We finished the bridge at the start of the long hill on the backside of the course. We knew that the break was too big to stay away, so I pulled through hard to keep the pace high, but ended up pulling away from the field. The break organized itself to chase which kept its pace high, and then when they caught back up to me, we got a good rotation going which meant that the field wasn’t going to come back together. Even though we had a good rotation with 4 out of the 12 riders in the break on our team, I knew that we were better off with a smaller break so that it wasn’t left to a 12 man sprint at the end and so that there would be fewer people chasing any attacks that we might launch. So I kept the pace high and then on the hill leading to the start/finish, we pulled hard enough to cause a separation. I think it came back together though right before the start/finish when there was another move with Will and Pat off the front with a couple other guys. This looked good because everybody was tired. Jim Brock knew it and attacked to bridge. I was right there with him and together the two of us were able to finish the bridge, but Jim popped right at the top of the hill settling the final break of six at that point. 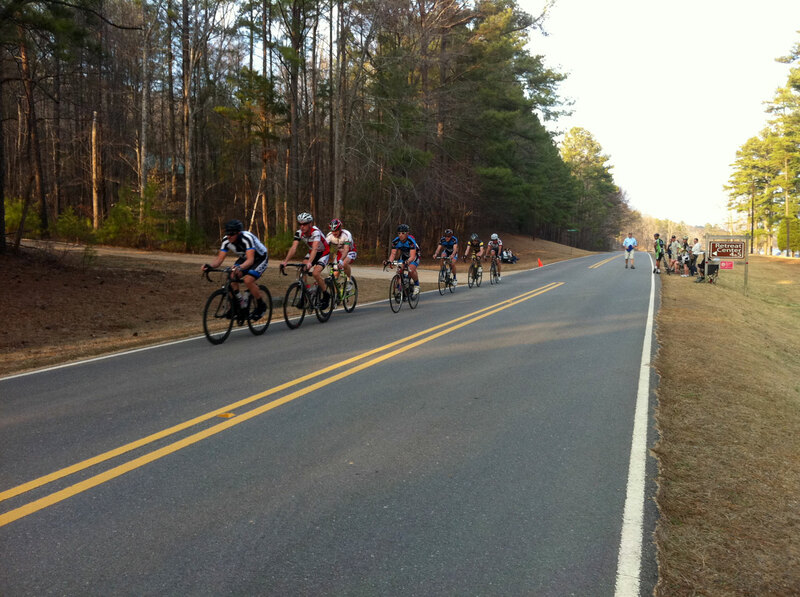 There were six riders in the break – Stuart, Pat, and me from Tria. Will represented Alabama Masters, and then there was Joe from the black/white jersey team and Alex from Alabama Cycling. 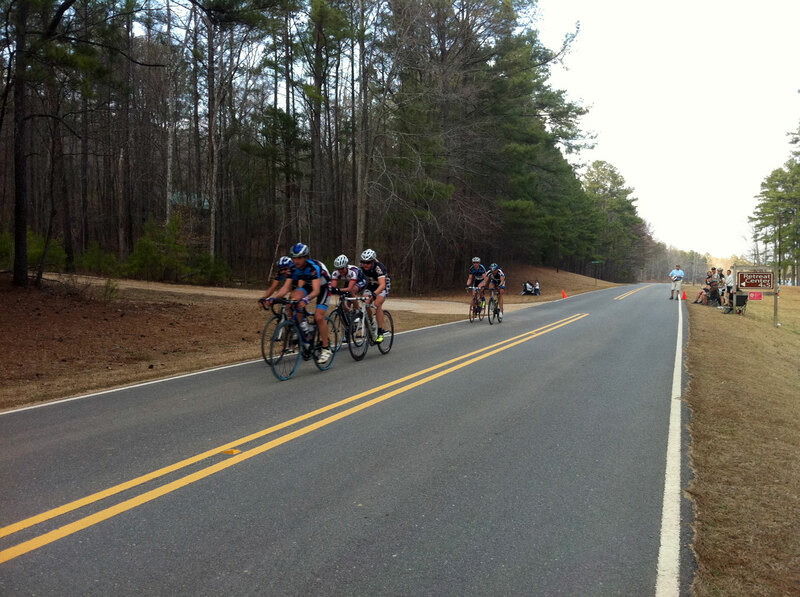 This was pretty much the perfect scenario for our team with all three of the Cat 1s in the break. We still had the rest of the third lap to finish and then two more laps, so I wanted a nice smooth rotation for us to get a good lead on the field, while giving us enough wiggle room at the end of the race should it come down to any cat/mouse games. That’s exactly what happened with everybody working together extremely well (average speed 25.4mph for the next 2 laps). Then right before the start of the last lap, I think everybody must have known that since we had numbers we were going to start attacking to try to get somebody away. The pace slowed down quite a bit. When we made it past the start/finish area I was looking for the right time to attack, found it, and only my teammate Pat was able to respond. We had a great gap and pushed it all the way to the finish. Behind us, Will and Stuart were by themselves with Joe and the Alabama rider dropped. Joe ended up bridging to Will and Stuart, and the two of them chased with Stuart able to take it easy and save energy for the finish. Pat and I decided as fun as it would be to try to practice the tactics of a two-up finish, that it would be better and more enjoyable to simply cross the line together, which we did! (See the attached photo). Behind us Stuart got the jump on Will in the sprint and coming into the last meters it looked like he had it, but Will with a very late burst of speed was able to pass him literally on the line with a bike throw. The remnants of our original break came back together with the field, and Chris Allison had a great sprint to finish sixth or seventh in the race. All-in-all, it was an AWESOME start to the season with our team placing five riders in the top ten and three riders in the top five. Our break with one lap to go. The second group on the road with one to go. Pat and I easing our way to a 1-2 finish! Stuart Lamp and Will Hibberts fighting it out for 3rd. 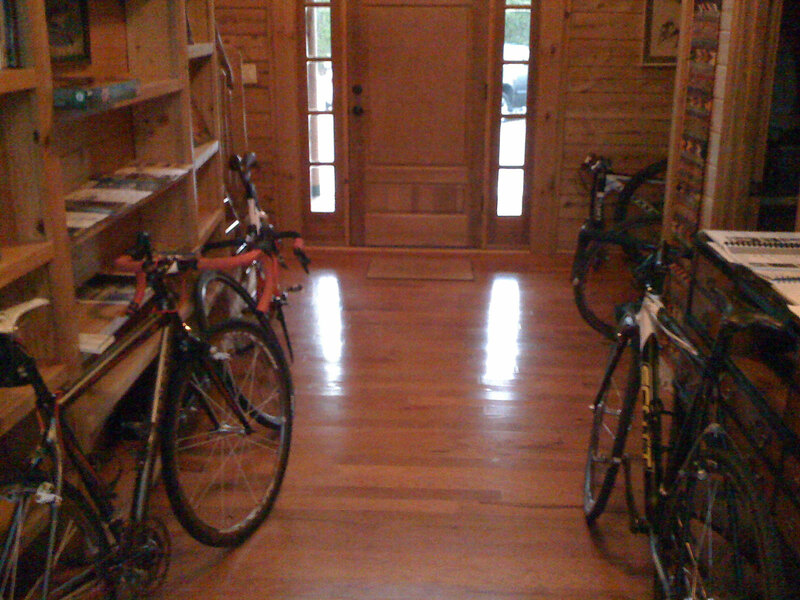 This entry was posted in Racing, Training and tagged heartrate, ibike, photos, podium, power, videos on February 21, 2011 by kartoone.